A high-quality car speaker can put the life back into your vehicle’s sound system. It has the power to transform your car into an entertainment spot by delivering exceptional sound and offering outstanding performance. That’s why it’s necessary to look for great car speakers when upgrading your four-wheeler sound system. However, as several varieties of car speakers are available, the selection is difficult. The best way to get the perfect speaker for your car’s sound system is to consider certain important factors before making the purchase. Here’s a quick guide to what you should look for when buying car speakers. The size of your car speaker is the first thing to consider as you can’t purchase an oversized or undersized speaker. You have to buy a right-sized device that can fit into your current speaker receptacles. Take out the old speaker from your car’s sound system and measure it. Write down the model number and specifications of the speaker and get a new one that matches the existing one. The sensitivity of a speaker refers to how much power the device needs to give a specific volume level. In simpler terms, the sensitivity of a speaker indicates its loudness and can be measured in decibels (dB). The higher the sensitivity level, the louder the speaker. If you want to get the most out of your car speakers, select the one with higher sensitivity as it will require less power and deliver maximum volume. The best choice will be a car speaker with over 90 dB sensitivity rating. Power handling means how much power a speaker can handle without causing any damage. Measured in Watts (W), power handling ability of a speaker should match the power put out by your car’s head unit or external amplifier. If you have a powerful external amplifier, choose a speaker whose power handling is close to the output of your head unit. When choosing the power rating, make sure which one do you want as speakers have two power ratings, RMS (root-mean-square) and Peak. The RMS rating of a speaker is its continuous output without getting damaged. On the contrary, the Peak rating is the maximum power a speaker can handle instantly. 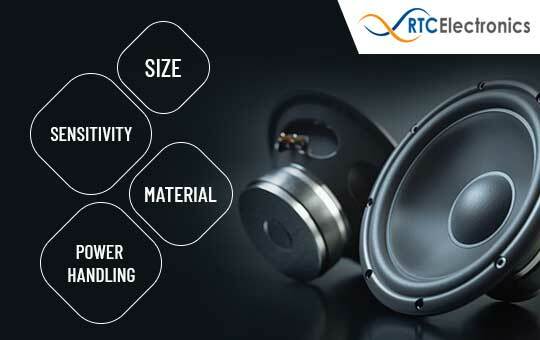 Go for the RMS rating because it realistically measures the power handling capacity of the speaker. The material your car speaker is made of plays a crucial role in determining its sound quality and lifespan. Speakers made with low-quality materials are likely to degrade over time. Speakers made with a stiff, lightweight woofer material like polypropylene mixed with metal-coated synthetic fabrics or mica are long-lasting and produce the best bass. Rubber surrounds are also a good option that lasts long and provides exceptional sound quality. Avoid buying surrounds made with foam and cloth or paper as they are not durable. As far as the tweeter is concerned, choose a hard material like ceramic, metal or graphite. When buying new car speakers, make sure that it is compatible with your existing sound system. Look for a device with high sensitivity, great power rating and excellent build quality to get value for your money. Also, always buy electronic devices and accessories from a reliable store in Toronto to get original products.